What makes the perfect Saturday? Vintage planes, cars and steam trains does it for me. 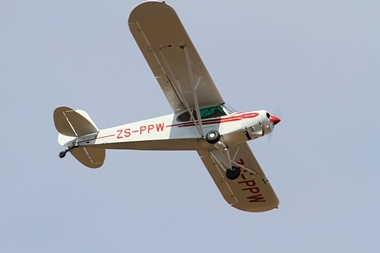 Throw in the best breakfast in town as well as the company of some likeminded friends and you have the best recipe for a day filled with the noise of high powered engines, the smell of Avgas and throbbing horsepower that makes for sensory overload. 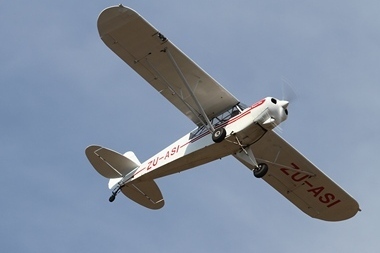 That is what happened at Jack Taylor Airfield (FAKR) on Saturday morning and on the road to Magaliesburg. Organised by Courtney and Roy Watson and Reefsteamers and supported by the Vintage and Veteran Club (Sports Car Club of Johannesburg) and the Tiger Moth Club the day started when 'Janine', the steam locomotive, and her dozen coaches depart from the Germiston depot with initial group of hard-core train passengers. Reefsteamers (www.reefsteamers.com) is a non-profit Company that is affiliated to the Transnet Heritage Foundation (Railway Museum) and controlled under their auspices. When Transnet discontinued daily steam operations during 1991, Reefsteamers was established at the old loco shed in Germiston. The main objective is to preserve and rebuild old steam locomotives. Reefsteamers also run special day and weekend trips for private persons and Companies to various destinations in order to fund their activities. 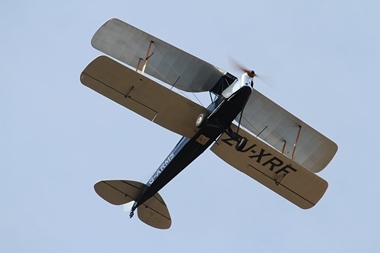 During 1993/1994, several Tiger Moth owners got together with a view to reviving the previous club known as The de Havilland Moth Club of South Africa. 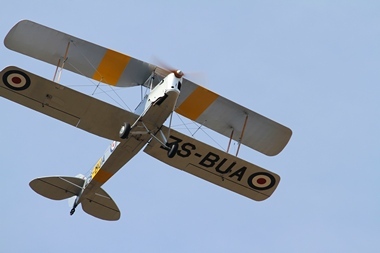 During 1994 an AGM was called and approximately 35 Tiger Moth and Chipmunk owners and interested parties got together and agreed that since the majority of de Havilland aircraft owners had Tiger Moths, the name of the club would change to 'The Tiger Moth Club of South Africa' (www.tigermothclub.co.za). The Vintage and Veteran Club (www.vintageandveteranclub.co.za) was established in July 1959 by a group of enthusiasts under the leadership of great people like Jeff Watson. After the Second World War the VVC originally formed part of the Sports Car Club in Johannesburg which consisted mainly of what we now classify as vintage cars i.e. cars built before January 1931. In the late 1950s the interest spread to later model cars and the Vintage car enthusiasts' views really didn't coincide with the plans of the Sports Car Club and the VVC was formed. Early on Saturday morning, '26 South', the restaurant in the clubhouse was packed to capacity with more photographers than was present at the arrival of Iron Maiden (well almost) as they waited for the cars to arrive. When they arrived every rushed outside to grass apron where a number of Tiger Moths and other vintage aircraft were already parked. Adding to the atmosphere were visitors in period costume and photo opportunities there were a plenty. 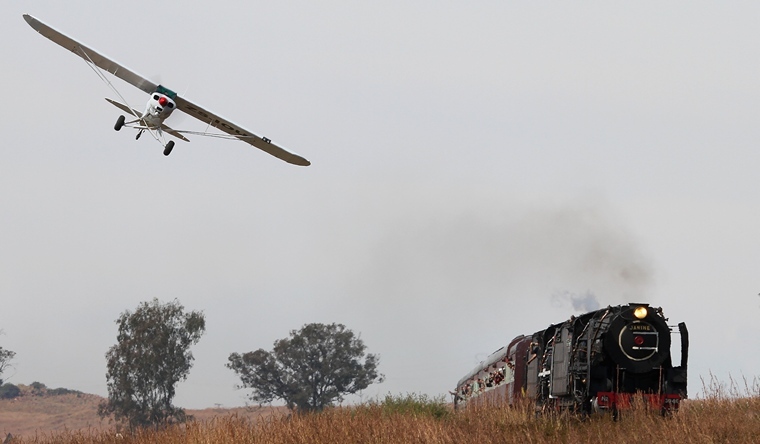 When news reached the field that the train was at Krugersdorp station the cars departed to rendezvous with the train on the Magaliesburg road just past Tarlton. The aircraft took off for their accompanying flight. The roadside was lined with cars and eager photographers and spectators to catch a glimpse of 'Lucy' on the tracks, cars on the road and the aircraft overhead. Choose your spot right and you have one change to get the right shot since the road was kept open and one had to content with normal traffic and other obstacles and hope that at least one of the six aircraft was at least close to the train. We were maybe not that lucky but it was still worth it. For something different diarise next year's 'Train Race.' The breakfast alone makes it worthwhile!